Swedish gaming giant NetEnt has created its third millionaire in a matter of weeks. 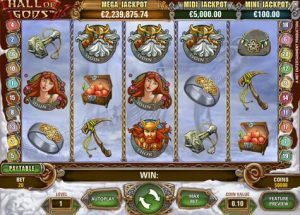 A Finnish player snapped up a massive €2.7 million on the Hall of Gods progressive slot. The leading casino software maker has now paid out eight seven-figure jackpots in 2018 alone. The win follows a €1.4 million scoop on Arabian Nights and €4.2 million windfall from Mega Fortune Dreams in recent weeks. These followed a stroke of good fortune for a Swedish online casino fan, who picked up a mighty €3.7 million on Mega Fortune in May. Not only did the latest slots millionaire pick up the regular Hall of Gods jackpot, but they claimed a bonus too. The slot was part of NetEnt’s Mega Million campaign to celebrate the World Cup, bringing in a cool additional €350,000. All that is known about the newest NetEnt millionaire is that they are from Finland. The winning Hall of Gods spin came on Paf Casino and was worth just €2. Progressive jackpot winners are allowed to remain anonymous if they wish, whilst they come to terms with their news. It is every slots player’s dream to see those reels land in the most perfect manner possible. However, it must be a gigantic shock! The Hall of Gods jackpot had reached €2,701,379 when the winner hit the magic combination. With the Mega Million bonus, the total winging its way to their bank account breached the €3 million mark. The Hall of Gods progressive slot is a five reel, 20 payline romp through the world of Norse mythology. You take on the gods, such as Odin, Idun, Thor and more, on their home turf. Symbols include the gods, hammers, axes and other typically Viking accessories. There are a number of ways to win big in Hall of Gods, with expanding Wilds your best bet in the base game. They grow to take over reels and offer more chances to complete winning lines. In the free spins round there is a 3x multiplier, whilst the Hall of Gods is the biggest deal of all. That’s where the jackpot comes into play. Land three scattered hammers and you’re in! Every spin, at whatever level, has the same chance of hitting the top prize. However, the more lines you bet on, the better your chances. The average jackpot win is around €5 million, with the biggest ever payout standing at €7.8 million. That came in April 2015, when a Norwegian online casino player struck gold at Betsson Casino. You can play Hall of Gods right now at PlayOJO. The Mega Million promotion campaign coincides with the World Cup and is part of a range of activities NetEnt has laid on for players. In addition to the two regular jackpots on Hall of Gods and Mega Fortune, the Swedish game developer will pay out an extra €1 million the first time the jackpots fall after the start of the World Cup. 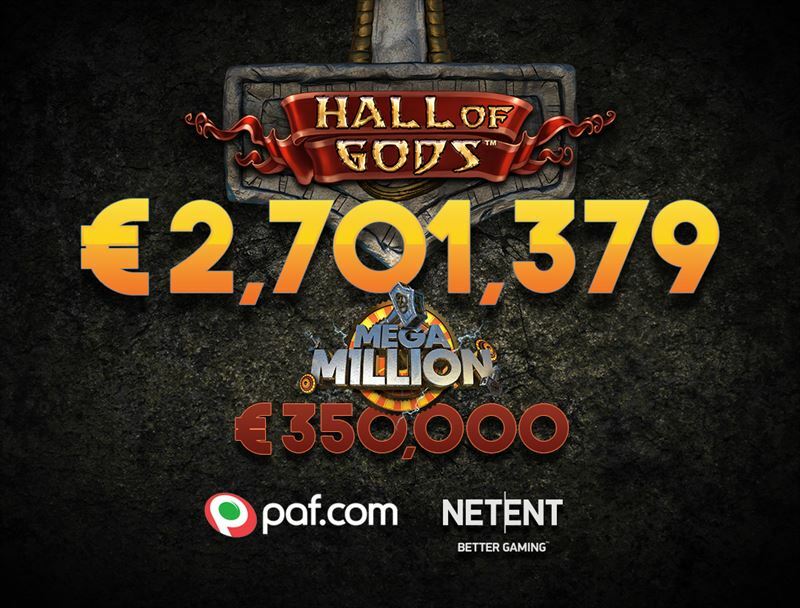 That’s €350,000 for the first Hall of Gods winner, the Finnish Paf Casino player, and €650,000 for whoever topples the Mega Fortune jackpot next. Even if there is no winner of the Mega Fortune progressive jackpot before the World Cup final, the bonus remains in place until the next success. There are also prizes worth €3,800 on every day on which there is a World Cup game. Find out more about this prize draw mechanic in this NetEnt promotion article. At the time of writing, the Hall of Gods progressive jackpot had already crept over the €500,000 mark. Could it be on its way to make another online slots player a millionaire? Might you be able to stop it today and bring in enough cash to pay off your mortgage, buy a new car and fund a holiday? The only way to find out is to play. You can join in the fun at most NetEnt sites, including Royal Panda, right now.